How many place names are there in the Hawaiian Islands? Even a rough estimate is impossible. Hawaiians named taro patches, rocks, trees, canoe landings, resting places in the forests, and the tiniest spots where miraculous events are believed to have taken place. And place names are far from static--names are constantly being given to new houses and buildings, streets and towns, and old names are replaced by new ones. It is essential, then, to record the names and the lore associated with them now, while Hawaiians are here to lend us their knowledge. And, whatever the fate of the Hawaiian language, the place names will endure. The first edition of Place Names of Hawaii contained only 1,125 entries. The coverage is expanded in the present edition to include about 4,000 entries, including names in English. 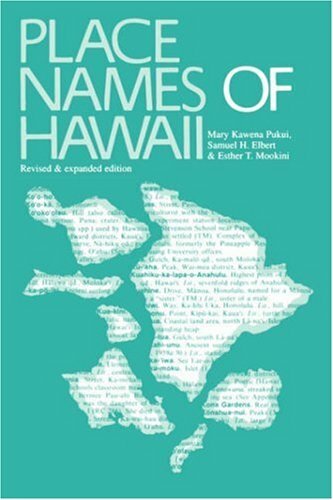 Also, approximately 800 more names are included in this volume than appear in the second edition of the Atlas of Hawaii. If you have any questions about this product by University of Hawaii Press, contact us by completing and submitting the form below. If you are looking for a specif part number, please include it with your message.